Will Alabama’s Shelby Kill Plan to Audit the Fed? As mentioned in an earlier post, Congressman Ron Paul has introduced legislation (HR 1207) to demand an audit of the Federal Reserve System. No body or institution in the world has so much power over our economy as does the Federal Reserve System. Yet, this private institution has virtually no accountability to the general public. 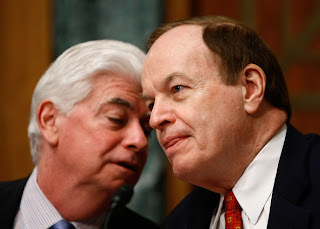 Displaying both passion and courage, GOP Senator Richard Shelby of Alabama has been leading the charge against a taxpayer bailout of the automobile industry. With pressure from both corporate interests and the White House, Senator Shelby is standing firm and leading the opposition to this big-government bailout. Shelby won his seat in the US Senate in 1986 as a Democrat, defeating Republican incumbent Jeremiah Denton. In his initial Senate campaign, Shelby had maximum support from organized labor, groups now clamoring for attention in the bailout legislation. Shelby’s home state of Alabama is home to major Toyota, Honda, and Mercedes plants. Yet, this Senator has chosen to face the special interests and stand for principle in opposing a giant step toward socialism. Porker of The Month (June 2010): Sen. Richard Shelby, Who Made Pigs Fly in Outer Space! Alabama Republican Sen. Richard Shelby has placed a unilateral hold on all of President Barack Obama’s executive branch nominees in an apparent protest over home state concerns. Shelby is frustrated over the Pentagon’s bidding process for air-to-air refueling tankers, which could lead to the creation of jobs in Mobile, Ala. And spokesman Jonathan Graffeo said in a statement the senator is also “deeply concerned” that the administration “will not release” funds already appropriated for a Terrorist Explosive Device Analytical Center to be built in Alabama. “If this administration were as worried about hunting down terrorists as it is about the confirmation of low-level political nominations, America would be a safer place,” Graffeo said. Isn’t that called extortion here in the real world? No matter, I guess, they don’t play by our rules anyway. To say that the trillion dollar plus bailout about to be rammed through is wildly unpopular is a gross understatement. What’s surprising is that the conglomerate of critics is not limited to libertarians or fiscal conservatives or even pragmatists, but includes individuals who are quasi-socialists and/or typical Bush Admistration loyalists. President Bush is “asking for a huge amount of power,” - “He’s saying, ‘Trust me, I’m going to do it right if you give me absolute control.’ This is not a monarchy.